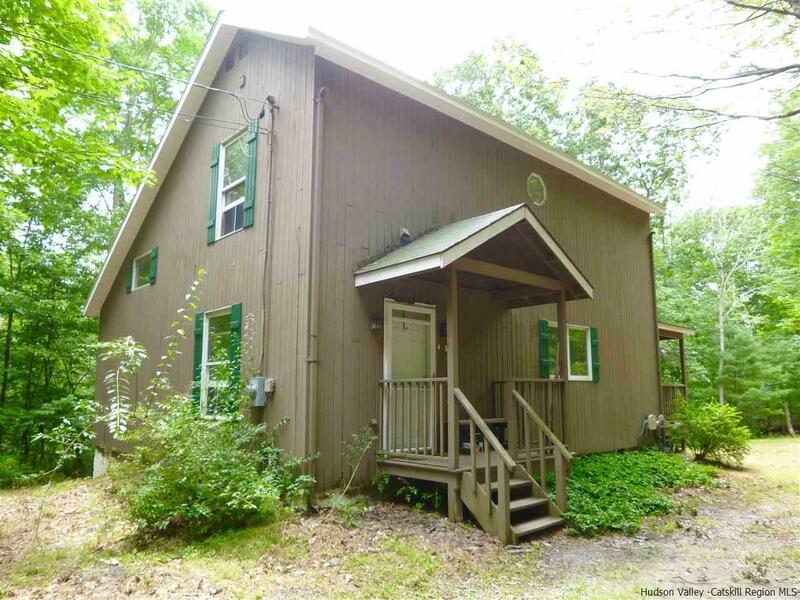 This Woodstock hideaway is in one of the best locations just 5 minutes to the village! Feel close to all the cultural amenities, shopping, music, restaurants and nightlife or head down the other side of Ohayo Mountain toward skiing, hiking, biking, fishing and Ashokan Reservoir strolls. But really, if you don't want to go anywhere, you can enjoy the sound of silence and plenty of nature and wildlife right from the back porch of this two story contemporary/colonial. Built by its current owner this home is manageable in size yet feels so much bigger due to the open flow, double height living room and really large kitchen. There is an additional and sizeable room on the first floor currently used as office/craft space, which doubles as a 2nd bedroom. Upstairs in addition to the bedroom and large full bath, is a sweet loft also used as a sleeping area for guests and convenient second floor laundry. The land is quite beautiful with gorgeous rock outcroppings on one side beyond the level garden area and on the other side, glorious verdant woods which make you feel as though you are living in the trees when gazing through the living room picture window. Truly peaceful. The style here is simple and country "rustic" with warm wood floors and trim that could easily be elevated to "country chic" with a few upgrades. Overall, this is a private retreat in a GREAT location, brimming with possibility for its next Woodstock homeowner to make it theirs.